The UK government has started resettling White Helmets activists and their families to the UK and the group is reportedly working closely with UNHCR, the UN Refugee Agency. This comes amid reports that the Netherlands has decided to cut off funding for the group due to alleged links between members of the White Helmets and terrorist organizations. Sputnik discussed London's decision to resettle the White Helmets activists and their families in the UK with David Icke, a political commentator. Sputnik: What can you say about the recent news that we're getting, very contradicting news, on the one hand we have the Netherlands that has decided to cut funding to the White Helmets over their alleged links to terrorism, on the other hand, we have the UK welcoming members of the White Helmets and their families to the country, what are your thoughts on this? David Icke: To understand the White Helmets is to understand that we live in an incredibly inverted world where everything is upside down. We have terrorists who are called moderate rebels, we have a United States government that says it fights terrorism when Washington is the global epicenter of state-sponsored terrorism, we have Silicon Valley giants saying they're going to stop the influence of US elections, when through their censorship and their search engines they're absolutely influencing the US elections. 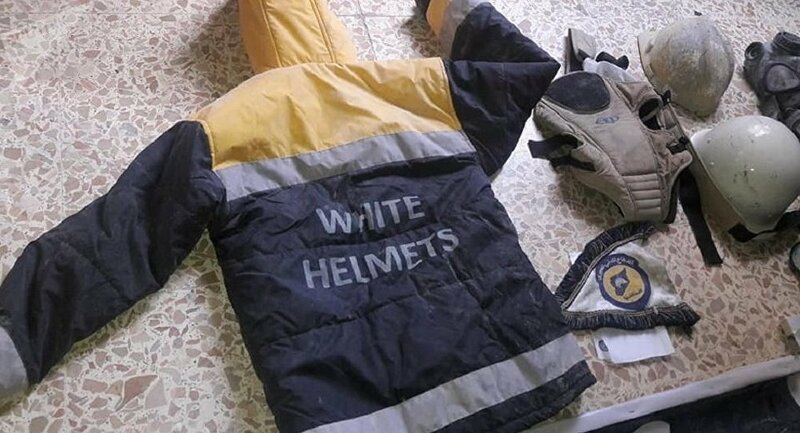 At the same theme, the White Helmets are called brave volunteers and true modern day heroes when they are fundamentally connected to the proxy army of terrorists that have been ultimately controlled by the US and, of course, the UK. That's why the UK was so happy to launch the so-called resettlement of the White Helmets when in fact it's an evacuation of people who have been now pushed into this enclave of Idlib thanks to Syria and Russian intervention, and basically they have nowhere else to go. There are those that have been caught in other enclaves; there was an example recently, where the US, the UK and Israel combined to get them out through the Golan Heights. It's all gone pear-shaped, basically, because the drip, drip, drip of the alternative media and the alternative view has basically accumulatively combined to show the people of the world what the White Helmets really are, and so repatriating them is what you would expect. Also, of course, they want to keep control of what these people say, because there's so much that these White Helmets, from their experience, could actually tell the world about what they were actually doing and who was really funding them. Of course from the UK angle, we should not forget that the White Helmets were actually created by a British army officer and mercenary called James Le Mesurier, who is very much involved in military intelligence, and as soon as he created them in Turkey in 2013, suddenly, just by coincidence, about $125 million of aid from the US, UK and other countries started heading the way of the White Helmets. There is a quote by a UK admiral, a guy called Sir Philip Jones, he is Chief of Naval Staff; he wasn't talking about the White Helmets but he captured (the essence of the situation) in one sentence, when he said about military techniques: "The hard punch of military power is often delivered inside the kid glove of humanitarian relief." The White Helmets are an absolutely fundamental example of this, and this is why people like George Soros and his Open Society foundation NGOs, using humanitarian excuses, are politically manipulating country after country; it's an old technique. Sputnik: Do you think there's a risk involved to UK citizens in the resettling of the White Helmets? Is there any chance that there could actually be people with very radical, dangerously radical sentiments? David Icke: Well let's put it this way, you have a situation where people are being repatriated to the UK and resettled, as they call it, who have been involved in the movie rescues exploiting children, pulling them from behind rubble, saving them from Assad's bombs, when actually the child has no dust on them and they're holding a pristine rag doll that is straight out of the packaging. You have the White Helmets who have faked chemical attacks to justify US missile attacks on Assad, so you're not dealing with a rational people, you're dealing with deeply disturbed people, you have only to go on the Internet to see footage of the White Helmets absolutely working together with ISIS at the time of people being shot and all the rest of it, so they're very, very disturbed people. But we should not forget this, the UK has an horrendous record, like the US, of sponsoring terrorism and using terrorists for its own ends. I mean the Prime Minister who is overseeing this White Helmets resettlement, Theresa May, was Home Secretary when people from UK-based Libyan families were allowed to move between Libya and the US without question when they were seeking, which was of course the plan of the UK, the US and NATO removal of Gaddafi. One of the people from those families involved in that was later blamed for the Manchester Arena bombing in 2017, which killed 23 people and wounded 139, half of them children, so when you do mess with very disturbed people for your own ends, then there is a kickback potential, very much so. Sputnik: The Netherlands has decided to cut the funding, to what extent do you think the true nature of the White Helmets has become known and to what part of the world? How many people, how many countries have actually acknowledged or understand their true nature? David Icke: I think the United States and the United Kingdom have understood the true nature of what they are from the start, that's why they were funding them, because they were serving their interests in trying to unseat Assad in Syria, but I think those that were not in it from the start, they are beginning to see more and more that there's a hoax going on here.